The artifact is found seven miles below the surface of the sea and beneath 40 more feet of sand. The Navy's efforts to raise a wrecked submarine uncover it - and set in motion a scientific race to retrieve it, to discover just what it is and where it came from. Denser than any substance known to man, it has broken every drill bit they've tried on it and will not budge an inch. It resists every effort to breach it - or communicate with it. Al Gore nightmare meets Blade Runner. Armed camps of eco-survivalists battle purveyors of technology in this exclusive, original production featuring five sci-fi masters and five all-star narrators. 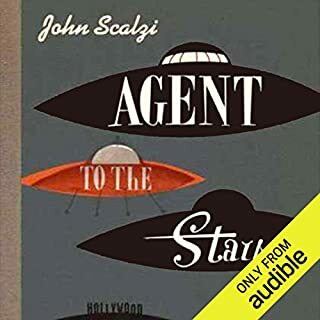 In John Scalzi's re-imagining of H. Beam Piper's 1962 sci-fi classic Little Fuzzy, written with the full cooperation of the Piper Estate, Jack Holloway works alone for reasons he doesn't care to talk about. On the distant planet Zarathustra, Jack is content as an independent contractor for ZaraCorp, prospecting and surveying at his own pace. As for his past, that's not up for discussion. But there's another wrinkle to ZaraCorp's relationship with the planet Zarathustra. Their entire legal right to exploit the verdant Earth-like planet, the basis of the wealth they derive from extracting its resources, is based on being able to certify to the authorities on Earth that Zarathustra is home to no sentient species. Then a small furry biped - trusting, appealing, and ridiculously cute - shows up at Jack's outback home. Followed by its family. As it dawns on Jack that despite their stature, these are people, he begins to suspect that ZaraCorp's claim to a planet's worth of wealth is very flimsy indeed and that ZaraCorp may stop at nothing to eliminate the fuzzys before their existence becomes more widely known. ©2011 John Scalzi (P)2011 Audible, Inc. The story sets up in a quite classic mode: fuzzy creatures are discovered on a planet being strip-mined for its resources. Are they sentient? If so, the corporations (and independent contractor surveyors) are out of jobs and minerals. In (now classic?) 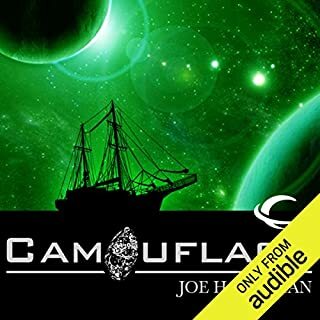 Scalzi mode, the characters are warm, deep, sarcastic, funny, and give great quips on cue, and the plot flies along at an easy pace, never slow, not too fast to leave the listener behind. Wheaton's narration here is nicely paced as well, not a long, drawn-out affair, nor one with heavy characterizations on the voices (when it comes, it's very nice -- but that's in spoiler territory). The fuzzies are cute -- but not unbearably, and there are a few laugh out loud moments here, and (our main character, the independent contractor) Jack's interactions with his dog, Carl, are wonderful. It is, however, over a bit too easily -- and unexpectedly quickly. Fuzzy Nation comes in at a little over 7 hours, with download "Part 2" being a Peter Ganim narration of the original H. Beam Piper novel Little Fuzzy which runs about 6 and a half hours. So don't be fooled into thinking you're approaching halfway through the story as part one comes to a close, or you'll be regretting (as I did) that we have to leave Zara XXIII so soon. On the other hand, that's certainly a packaging and marketing artifact, and the 7 "Fuzzy Nation" hours of this audiobook were a good, enjoyable story, showing off what Scalzi can do with good characters: take us on a fun trip through another place, make us laugh, make us cry, and give us a little bit of what it means to be human -- even if we see it reflected in the eyes of someone much smaller and furrier. On Ganim's narration of "Little Fuzzy", it was definitely interesting to compare the setup, characters, and storyline of the original novel to the reboot's, and Ganim is as-always quite competent. His reading is a bit slower-paced, which adds a bit more to the era contrast between the books. What does Wil Wheaton and John Scalzi - introduction bring to the story that you wouldn’t experience if you just read the book? This is one of Wil Wheaton's better narrations, he does more voices than he usual does, which is nice, it's always nice to differentiate between the characters. As usual, Scalzi ends almost every dialog with a he/she/it said speech tag, which can be exhausting to listen to. While I find this exhausting, I still like Scalzi's stories, so I try and look past it. The story takes place on a planet 150 light years from Earth. We meet Jack, a prospector for the mining corporation that holds exclusive rights to exploit the uninhabited planet's resources. The day the story starts is a busy day for Jack: he discovers a rich vein of valuable minerals, and later discovers a new type of creature trapped in his house. This book is an engaging remake of a classic story. It's the sci fi we loved as kids (new planets, amusing creatures, cool gadgets), modernized (how was it that none of the classic sci fi ever really got the idea of modern computers or the internet?). However, if the old style sci fi was often called "cowboys in space" due to the shoot-'em-up frontier town attitudes of the main characters, this modernization brings in the current craze for courtroom dramas: call it "lawyers in space"? So, if you hate John Grisham novels, you'll dislike a good chunk of this book. Also, there are times when you're wondering how the characters could be so stupid as to not see what is plainly obvious, so it's the experience of knowing ahead of time what the characters are taking their time discovering. Finally, understand that the novel is only 7 hours long (7:19). At the end of Part 1, the novel is finished. Part 2 is actually the novel that this one was based on. I haven't listened to that one yet. If you're not the type who would go watch earlier versions of modern re-make movies, then you may not be into listening to what is (probably) nearly the same story twice, so if you've budgeted for 14 hours of listening, please understand that you're actually getting only half of that. This is a touching story with a modern twist to it. It'd make a good movie. Where does Fuzzy Nation rank among all the audiobooks you?? ?ve listened to so far? Fuzzy Nation and Little Fuzzy are one of my best audio experiences this year. I like both stories and the narration was excellent. What other book might you compare Fuzzy Nation to and why? 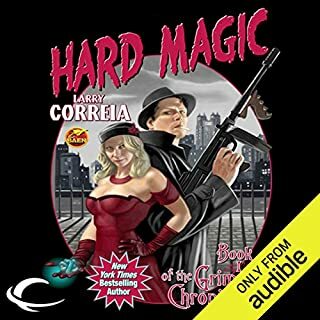 In this audio book you get to compare Scalzi's telling of the story with Piper's original story. Although I like Scalzi his story is more light weight and almost a cliche compared to the original. Story is 4 for Scalzi and 5 for Piper. My ratings are reversed for the naration. What does Wil Wheaton and John Scalzi (Introduction) bring to the story that you wouldn?? ?t experience if you just read the book? Wil Wheaton is an excellent narrator but I think little was added to the story or intro by having excellent narration. 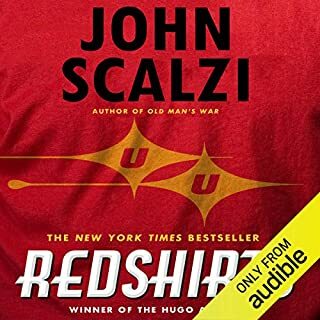 Perhaps the emotional impact is improved by the narration, that is the one thing Scalzi heightened and improved upon the original and Wil really brought it out. Toward the end of both stories ??? yes. I like Scalzi but Piper's Little Fuzzy is better and a 5 star classic. Your mileage may vary. I don't normally involve myself in writing reviews, as what I like, isn't necessarily what you like, but in this case I feel compelled to. This book was in a word AWESOME!!!!! No I have not read the 1960's version, and maybe that is good or bad don't know. This book was so well written. I listened to the entire thing today. I laughed the entire way through. He wasn't just a writer confusing himself with a comedian. The way he slid the humor in almost imperceptibly was wild. You didn't know it was funny till you caught yourself laughing. No I am not a literary genius or giant, but I am above average for intelligence, although I am so tired I did have to use spell check twice. 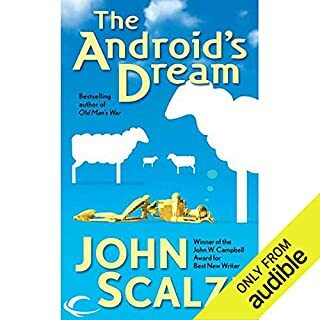 Seriously, this is the first book by John Scalzi I have read, but will not be the last. No not an original idea, but how many publishing company give permission for rewrites on a book. Cant be too many. Maybe one day there will be a sequel. If you want a good old fashioned read. GET THIS BOOK!!!! Enough of my rambling. Happy reading all. This download is two books for the price of one. Part I is John Scalzi's Fuzzy Nation; Part Two is the 1960's "inspiration" for the more recent book (Little Fuzzy by H.Beam Piper). While both books have a similar theme - saving the (little people) Fuzzies from the machinations of big business and thoroughly nasty associated characters via a courtroom drama - the books differ in the way that the plot develops and the case that is made for "sentience". The earlier book is actually far more sophisticated in its account of the psychology-philosophy of consciousness and the criteria for sentience (Weiskrantz's formally developed thesis that consciousness consists of higher-order thoughts is brilliantly anticipated here). John Scalzi's book is more contemporary in its feel (e.g., nobody smokes a pipe and the Fuzzies are not immediately recruited as pets). Scalzi also makes much of the lawyerly argument and the rebel-with-a-cause character of the main human protagonist. I thought it was a shame that the critical evidence for language was identical in both books, and that it was so far anticipated in John Scalzi's version as to be utterly and completely obvious by it was revealed. This evidence comes as a greater surprise in the earlier version of the tale - it is presented almost as an afterthought in the middle of complex plot twists. That said, there are enough differences between the two books to make it worthwhile hearing the story twice and enjoying the changes that have happened in our culture over the past 50 years. John Scalzi is to be congratulated in re-animating and presenting a story that would probably have been lost - and for his creation of some lovely and loveable characters. I first read Little Fuzzy when I was thirteen, and I loved it. I went on to read the other Fuzzy books Piper. So naturally when I first saw this I was a little upset. Why would any rewrite such an awesome book? Because I was so skeptical I didn't actually get the book for a couple of months after it was published, my loss, now though it is one of my favorite books and I have listened to it probably about five times now. The story line is VERY different from Little Fuzzy, but it is still really good. There are some great court room scenes in this book and some really great character development. John Scalzi did a great job of bringing Little Fuzzy back and in a way that someone in the twenty first century can enjoy. There are some violent scenes in this book, but the blood is very minimal. PG. There is quite a bit of swearing in this book, which was not in the original Little Fuzzy. None, though it is mentioned a couple of times. This is a great story. If you liked Little Fuzzy give this book a try, and if you never ready Little Fuzzy then I highly recommend it. This is a great book. The first part is Fuzzy Nation and the second file is Little Fuzzy so this is a short book, about eight hours. John Scalzi teams up with his friend Wil Wheaton again to deliver Fuzzy Nation, an entertaining short story set on a distant planet. Although this is a modern re-write of an older story it is still obvious that the original story is from a simpler time. Wheaton does his usual solid job as a narrator. He reads well but he doesn't do a lot of voices so his performances are slightly limited compared to some of the other narrators. This is a classic tale of a corporation exploiting resources for profit and destroying the environment until a new life form is discovered - the "Fuzzies". There is an ensuing legal battle to protect the home world of the "Fuzzies" as scientists and lawyers square off with differing opinions. The moral compass of certain characters waver as vast sums of money are weighed against the protection of this newly discovered species. Scalzi injects his usual humor into the story and 7 hours felt about right for this one. Although predictable at times if you are looking for a short, light sci-fi story then Fuzzy Nation will serve you well. Not quite a 4 star tale for me and I would have given it 3.5 stars if allowed. Pure fun - Scalzi and Wheaton are great together! This is Scalzi at his storytelling best. In many ways it reminds me of a Heinlein "juvenile", that is to say there is nothing childish about this book. You can comfortably share this with a bright young person who will enjoy it with you. It's a straightforward retelling of a somewhat familiar tale - but Scalzi has fun with it and that fun is contagious. The characters are vibrant and well drawn. While there is little "world building", the universe is familiar and well defined. Wil Wheaton was a brilliant choice for the narration and it is my sincere hope that other collaborations will follow. Thank you Audible Frontiers for bringing us this stellar performance! I like Scalzi's books. I'm not sure what kind of license he had with this remake so I'll give him the benefit of the doubt. This book was interesting but predictable. The court room stuff at the end should have been the home run run but it sorta fell in to "you're seen it before' predictability. I like I'll listen to the original next. Lovely retelling of a classic. My only issue, the reuse of "He said" gets really obvious. Otherwise it was a great reworking of a classic story from the 60s. A engaging sci fi with a satisfyingly anti-corporate message and an overall upbeat mood although there was the odd bit that I found quite moving. Wil Wheaton is a great narrator - just right for the tone of book. And the fuzzies themselves are rather charming. I've never read the original (or, to be honest, heard of it). However this was an easy listen with a satisfying progression through the story. Good science fiction - not overplaying the technology or differences between our time and theirs. A story which tells itself straight - and well read by Wil Wheaton. Made me laugh in a few places too - and I wish the characters could be in further stories (generally a good indicator of a story enjoyed). Fantastic feel-good science fiction. Story grabs you from the get go. Fun and well written escape. This book has a bit of everything, it made happy, sad and laugh. I really could ask for more from a book. Scalzi only has four characters in his armoury, but boy they are great characters. I love the way he inserts clever situations into a twisting plot, that retains momentum throughout. This is an action story, courtroom drama and moral tale all rolled into one comedic novel. Listen, enjoy, become a fan. What did you like most about Fuzzy Nation? A great reboot of the original Little Furry; it's understandable why the Piper estate agreed to John Scalzi's updated version. Excellently narrated by Wil Wheaton - as always - drawing us into this very well balanced book, with its subtle use of technology. Enabling us to follow the storyline of Furry discovery without being overwhelmed to the point of suffocation by future technologies. Stop reading me drivelling on about how great yet another John Scalzi's novel is and read it. You'll not only thank me but want a Furry to boot! Which character – as performed by Wil Wheaton and John Scalzi (Introduction) – was your favourite? Wasn't sure what to expect but took a risk with recommendations from Reddit. I flew through this book. Kept my attention 100% of the time and I was sad it was over. Wil Wheaton was perfect as usual. One of my top 10 books. This is an absolute fantastic read.Wil Wheaton is an exceptional narrator who brings John Scalzi's brilliant novel to life.I dare you not to fall in love with the Fuzzies. Fuzzy Nation is an engaging read that has been performed well by Wil Wheaton. John Scalzi does a good job to introduce the world of the Fuzzies to those who are unfamiliar with H Beam Piper's Little Fuzzy. I only had two issues: the over use of the word 'said', which became distracting, and the speed of Wheaton's narration. Far better story than I expected. This book had been sitting on my phone for an age unread. What a mistake, once I started listening I could not stop 'til the end.